Are your flower borders an exciting component of your landscaping? When you pass by them on the way to your mailbox, do they put a smile on your face? If the answer is no, it's time to look for some new ideas to jazz up these critical areas to improve the overall appearance of your yard. Yellow alyssum, like creeping phlox, is often used as a flowering ground cover plant. It contrasts strikingly with grape hyacinths not only in color but also in another respect: It is a bad-smelling flower (whereas grape hyacinths are fragrant flowers). But if you don't need flowers for their fragrance, yellow alyssum will surely wow you with its color. 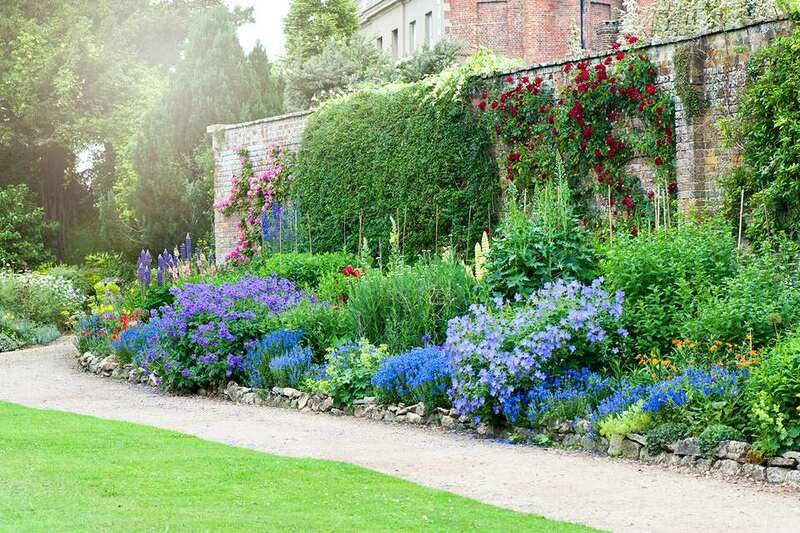 For American gardeners, a popular idea is to create a summer flower border using red, white, and blue flowers. Such patriotic displays are usually composed, at least in part, of annual flowers. 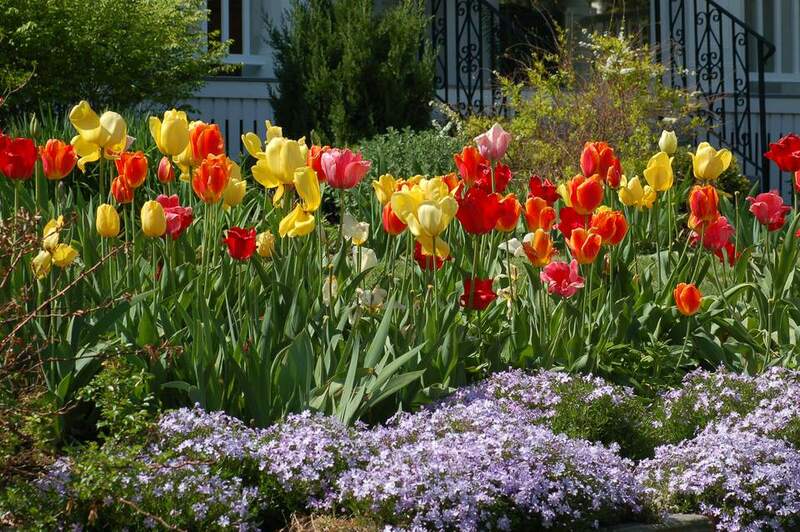 Annuals are inexpensive bedding plants, allowing you to plant an impressive display without breaking the bank. If you want all of the plants to be in bloom at the same time (such as around July 4th), be sure to choose plants that will bloom in unison. Autumn Joy sedum is a late-bloomer that's ideal for fall displays. A long-blooming perennial, planting it assures continuous garden color from late summer until the first hard frost. In this garden, the Autumn Joy sedum is complemented by 'Silver Dust' dusty miller, among other plants. Dusty miller is a common choice when silver foliage is recommended. The brightness of its frosty, white fronds leavens a scheme that is otherwise dominated by the dusky-pink tones of the Autumn Joy. It's not always "prime time" for a particular flower border. For four-season interest in the landscape, the key is to plan a flower border with just as much of an eye for foliage as for flowers. In this garden, 'Purple Fountain' beech tree provides a background to the golden type of creeping jenny ground cover in the foreground. This flower border also exhibits a pleasing variation in texture. For example, while the creeping jenny has leaves with a fine texture, the presentation of the hosta plants behind them is considerably coarser. The annuals (marigolds) brighten the composition and afford long-lasting color for little money. Pachysandra is a foliage plant; this groundcover furnishes a nice, solid-green background and keeps this flower garden border from looking too busy. Meanwhile, the evergreen shrubs offer a different plant form (they're globe-shaped) from the rest of the vegetation. The softscape only begins to tell the story of this flower garden border as the hardscape nicely complements the plantings. The yard art serves as a focal point, while the fence breaks up the planting into more easily digestible segments. Finally, notice the effect of the cobblestone driveway pavers lined up along the edge. One of the functions of garden edging or lawn edging is to frame a display area. The cobblestone achieves that and more. Its appearance is rustic enough to retain an informality akin to its flower garden border. Ornamental grasses that are tall to intermediate in height work well in flower beds as they don't overwhelm the other plants. Maiden grass, zebra grass, and purple fountain grass are popular options. Different textures and plant forms can spice up a flower border considerably. The two bright red flowers in this garden are "love-lies-bleeding" and coleus. Coleus is an annual foliage plant that is indispensable for gardeners looking to experiment with color combinations in planting beds. It's a classic shade plant, although many types do just fine in bright sunlight as long as they receive sufficient water. To the right of the love-lies-bleeding and the red coleus, the plants with the airy foliage are cosmos. Their feathery leaves contrast nicely with the rest of the flower border. The spectacular plant in the middle of this flower border with red stems and deep burgundy leaves is castor bean plant. This is a great example of how much a foliage plant can do to spice up a planting. This type of castor bean plant has such dark leaves that it can be categorized as one of the so-called "black plants." As such, it's wonderful for color contrasts with brighter plants. However, castor bean plants are toxic, so they may not be the best plant to have growing in your yard if children will be playing there. This large flower border with black-eyed Susans helps illustrate the principle of proper scale. If you can imagine a much smaller flower border in front of this home, you can see how it would be swallowed up by its surroundings. A house and landscape of this measure require a flower border sized to match. The same principle works the other way around. Aesthetically speaking, smaller trees for one-story homes are generally the most appropriate choice. Layered flower borders are composed of rows (or "ranks" as the British say). A layered perennial planting features tall perennials in the back row and short perennials up front, with medium-sized plants growing in between. Designers sometimes stray from this regimen for effect, as when a relatively tall plant is installed in the front row to make a strong statement. From a practical standpoint, layering ensures that the shortest plants are not deprived of sufficient sunlight. You may also layer for aesthetic reasons, so that plants are arranged in the most pleasing composition, especially from the primary viewing angle. The plants at ground level are growing in containers, although the containers are so well hidden that, at first glance, you might think they're growing right in the ground. Varying the color of the petunias (there are three colors) provides more interest than using one solid color. The ground display is supplemented by window boxes. Catmint flower borders are pretty, but they can lack pizazz if left on their own. In this example, catmint gets some help from tubs of petunias. The containers are not disguised, and rightly so, since the ceramic tubs are gorgeous. Flower borders sometimes take the form of flowering edging plants. Here, wax begonias (Begonia x semperflorens-cultorum) create a colorful ring of alternating red and white flowers around a shrub bed.